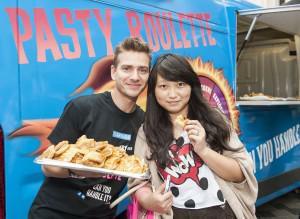 On behalf of Greggs and Havas PR UK, Kru Live’s team goes on tour. Brits are a nation of scaredy cats when it comes to spice with only 1 in 5 believing they are ‘well hard’ when it comes to eating spicy snacks. The study of 1,000 people was conducted to coincide with the introduction of Greggs new Chicken Madras Lattice, which launched with a week-long tour of ‘Pasty Roulette’. Greggs the food on the go specialist is visiting high streets around the UK, asking the nation if they can handle the new spicy treat. The nationwide sampling road show was created by Greggs and Havas PR UK and implemented by Kru Live – The Pasty Roulette team has so far visited Glasgow, Manchester, London’s Southbank and Covent Garden. Members of the public are asked to spin a roulette wheel, with the chance to land on one of five levels of spice, ranging from mild to explosive. It will then be up to the shopper as to whether they are brave enough to try a pasty treat, depending on what level they land on. Those who take part receive a voucher for a free Chicken Madras Lattice and are encouraged to upload a picture of themselves taking part to the Greggs Facebook page or twitter with #pastyroulette.